Walk, jog, or run outdoors with your young child – this is the promise of a good jogging stroller. They’re comfortable for your kid and allow you to get back to exercising outdoors, all while bonding with your little one. Read on to check out the many benefits and features of jogging strollers and what to watch out for when buying the best jogging stroller for your needs. Lots of safety features to keep your little one secure on runs make this stroller the best pick if you want a worry-free jogging experience. A sleek design, fixed wheels, and built-in suspension make the Thule Glide 2.0 the ultimate in performance jogging strollers. A lightweight, portable stroller that folds in a second, the Graco Fastaction is a great pick if you’re looking for something more budget-friendly. The Summit X3 makes jogging with your little one a breeze. It’s durable, comfortable, and easy to fold. The Expedition makes our list of top picks thanks to its large bicycle tires that roll effortlessly over all surfaces. A mountain bike-style suspension system and air-filled tires offer an ultra-smooth ride for your child. Durable, maneuverable, and easy to fold. Easy to fold with one hand. Reflective stripes all around the canopy and wheels. Ergonomic handlebar, and plenty of storage space. Suspension, front wheel lock, reflectors, a deluxe parent’s tray, and lots of storage space add a lot of value to this budget pick. All-wheel suspension system, hand-operated rear brake system, and front wheel lock make this a multi-functional stroller. Good frame with an effortless one-touch folding mechanism. Compact size, ergonomic rubber handle, and great storage space. Larger than other competitor models, making it less transportable. The high price prevents this stroller from being friendly to low budgets. Poor durability. It’s not as well-made as some of the more expensive models out there. Lacks cargo space compared to larger strollers. In terms of safety features, this isn't the most robust and secure model. Get outside again. Reclaim your workout. You can get all of the normal cardiovascular benefits of walking, jogging, or running outdoors with the added resistance of the extra weight of your child. Extra storage. Never run out of water, juice, or snacks again! A jogging stroller has tons of storage space so you can take along everything you need for you and your little one. Easy stretching. We all know stretching can be very beneficial to your health, and a jogging stroller can offer you extra incentive to get flexible. Most strollers have a stable bar you can use for stretching before and after exercise. Quality time. Take your child along on walks, jogs, and runs. Share your passion for the outdoors and exercise and bond with your little one. Better visibility. Jogging strollers are large and very visible. That means others will be better able to see you, which is always a good thing outdoors. 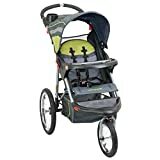 What makes a jogging stroller so unique from a regular stroller? There are actually several key differences. Jogging strollers have large rubber tires compared to the small plastic wheels of most prams. Jogging strollers also feature a built-in suspension system to avoid jostling your child around and a larger base between the wheels for additional stability. They are more durable and maneuverable, making them ideal for exercising both on the pavement and on light trails. There are two main types of jogging strollers: ones with a fixed wheel and ones with a locking front wheel. With a fixed model, the wheel doesn’t turn. This type offers the most amount of stability and control while running in straight lines. However, it’s harder to turn, which can be a downside depending on where you want to use the stroller. On a locking-wheel version, the front wheel can turn or lock in place. This variant has the benefit of being more maneuverable but trades some stability when going in straight lines. Founded in 1942 in Malmo, Sweden, Thule is among the most popular brands out there. They make quality, reliable, and aesthetically-pleasing jogging strollers. Among their most popular products are the Glide 2.0 and the Urban Glide 2.0. Headquartered in Eugene, Oregon, Burley has been making strollers and other quality products since 1987. Their most popular product is the Solstice Jogging Stroller. For more than 30 years, Baby Jogger has been designing and making great strollers from their Atlanta, Georgia headquarters. Among the most popular stroller brands out there, Baby Jogger is a name of quality. Their most popular product is the Summit X3. $150 and below: Basic budget options are at this price point. You can find a good stroller, but it will be bare bones and less durable compared to more expensive competitor products. $150-$350: In this range, you’ll find a number of high-quality strollers with excellent durability and some convenience features. Both fixed and locking front wheel strollers are common in this range. $350 and above: This premium price point comes with premium options. Strollers in this range have more storage and a bigger range of accessories. They’re also lighter and more durable. Jogging stroller wheels use air-filled tires, similar to those you would find on a bike. They tend to be easy to detach in case repairs are needed. Most jogging strollers come with a number of safety features. These include a parking brake to keep the stroller from rolling away, a five-point harness to strap a child into the stroller, and a safety tether to keep the stroller connected to you. Hand brakes come standard in a number of models for added safety. Some also have a sun canopy to shield the child from the hot sun. A few strollers are even compatible with infant car seats. Strollers at higher prices tend to have a few convenience features. Better organization via an area for small items is common, along with a folding mechanism for easier storage. Some have cup or bottle holders near the handlebar. Likewise, suspension shocks are common for a smoother ride. Adjustability: Personalize the feel and performance of the jogger. Any wheel with adjustable tracking can keep the jogger running straight and true. An adjustable handlebar makes it easy to set the height for optimal comfort. Accessories: Children and jogging both require a lot of small items to carry around. Different joggers come with different storage solutions for accessories, devices, bags, snacks, and more. Upgrades like baby bassinets, standing platforms for taller children, extra padding, and more are also common. The BOB Revolution Flex is our top pick thanks to its air-filled tires and mountain bike-style suspension system. The front wheel locks for stability while jogging and can be unlocked when you want more maneuverability. The adjustable handlebar helps you achieve the perfect fit no matter your height. The seat is padded and ventilated, and an extra large sun canopy ensures a comfortable and cool journey for your child. This stroller is also compatible with BOB infant car seats and is suitable for children up to 44 inches tall. Since it’s a durable stroller, it’s on the larger side. Prepare to get a good workout pushing the extra weight, or look for a sleeker stroller that has a lightweight frame for smooth, efficient rolling. The Graco Fastaction is a great pick if you’re looking for something more budget friendly that doesn’t skip on the convenience. The one-second, one-hand folding mechanism has the added benefit of automatically locking into position to make storing it in your car super easy. The tires are air-filled to offer suspension, and the front wheel can lock into place for better stability. Reflectors are around the frame for extra visibility. A deluxe parent’s tray features a cradle for your smartphone, two deep cup holders, and a covered storage compartment for convenience. A major downside of this stroller is its durability. Because of the low price point, it’s not as well-made as some of the more expensive models out there. Likewise, there have been a few reports of the stroller tracking to the right when the front wheel is locked. This stroller features a fixed, 16-inch front wheel and two 18-inch rear wheels for superior jogging performance. Built-in suspension makes the ride smooth and comfortable for both you and your child, and an integrated twist handbrake provides fine speed control. Thanks to reflective rims on the wheels and a reflective edge on the canopy, this stroller has great visibility. The Glide 2.0 can be folded with one hand and is easy to transport thanks to its sleek design. It’s ergonomic and easy to adjust, with plenty of room to bring anything and everything you might need. A multi-position canopy with side ventilation keeps your kiddo comfortable. The peekaboo window with magnetic closure also lets you easily check on your child. The only real drawback to this stroller is its high price point. For a fixed-wheel stroller, the extra cost comes from all of the additional safety features and accessories. If you can do without the extra perks of the jogger, try a more budget-friendly option. The maximum level of comfort and performance. The all-wheel suspension system soaks up road bumps, making this the perfect all-terrain stroller for your trail running needs. A hand-operated rear brake allows for maximum control over uneven terrain. A front wheel lock mounted to the handlebar makes it easy to switch from jogging to stroller mode. In addition to its durable design and convenient features, the Summit X3 also has a large, adjustable sun canopy to shade your child. Peekaboo windows and side vents up the comfort level even further. Finally, this stroller is easy to fold thanks to its patented quick-fold technology. A major con for this one is that it lacks the cargo space of other strollers. If you know you’ll be taking along a lot of goodies, we’d recommend a pick with more cargo space under the seat or in the back. The Expedition has a durable build, folds up with a single touch, and can easily pack up due to its compact size. An extra wide, ergonomic rubber handle makes this one a pleasure to push. Both the parent tray and the child tray feature cup holders and a covered storage compartment round out the set of convenient features. The Expedition is also compatible with a number of car seats for better security. One of the main drawbacks here is its relative lack of features compared to some other models. If you’re looking for something with more bells and whistles, this isn’t the pick for you. When using your jogging stroller, there are a few important tips to get the most out of your running experience. Pay attention to the size and age limits of the stroller. Using one that’s not meant for your child’s age/height/weight can be dangerous. Stick to clearly marked paths and sidewalks when possible. Use the full harness to keep your child safe. Keep the wrist strap attached if one is included, and make sure to use it right. Check the tire pressure every now and then to keep the ride smooth for your child. Is it safe to put an infant in a stroller? A: Generally, it’s safe to put an infant in a jogging stroller if the child is at least 8 months old. Before that, babies can’t hold their head up, so it would be dangerous to put them in a stroller due to the jostling motion. Make sure the stroller you buy is made for an infant. Do attached accessories fold with the stroller frame? A: Depending on the kind of accessories, they may fold with the frame. For instance, a detachable tether or sun canopy will likely fold along with the rest of the stroller. A large bag attached to the handlebar will get in the way. Can the stroller go on challenging terrain like sand? A: We recommend that you stick to semi-smooth terrains like pavement or light dirt trails that don’t have too many rocks or gravel for safety reasons. It will keep the ride comfortable for your child and will ensure that the jogging stroller’s wheels and suspension can handle the terrain. Our top pick is the BOB Revolution Flex for its feature set and good price point. It’s durable, comfortable, and easy to use/fold. If you’re looking for a more wallet-friendly option, the Graco Fastaction Fold Jogger Stroller is our winner, thanks to its quick-fold mechanism and compact design. What’s your favorite jogging stroller? What did you think of our picks? Let us know in the comments below!